Welcome to the Illustrative world of Kimberley Scott. Featuring news, scribbles and general inky splats...all brought to you by Marcel the Mouse. So last week I went to The Big Apple! Finally, after a looooooong time of wanting to go we found (or made) the time to actually do it...fly to New York. It was amazing. As soon as you step out from the subway station it just hits you...right in the face...noise, flashing lights, people, dogs, suitcases, noise, cars, yellow taxis, the smell of pretzels, skyscrapers and...did i mention noise?! They says its a city that never sleeps...well I'd very much agree with that, and I'm not sure we did either whilst we were there! Metropolitan Museum of Art - of course I HAD to visit this place! Just LOVE these - cookie monster's my favourite! Oh and I think I spent half a months wages and ate my body weight in MnM's whilst out there...the peanut butter ones are just TOOOO good! 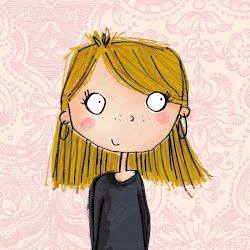 I am a freelance Illustrator and Designer, working in the world of Children’s Books, greetings cards, licensing and calligraphy. I live and work in London, from my teeny weeny studio, with a constant supply of green tea and pick and mix sweets to keep the creativity flowing! With a fascination for line and a constant thirst to draw I create quirky yet somewhat traditional illustrations. It’s my imaginative world, where pattern, detail and a slight ‘skewiff’ essence is always present. If you like what you see and want to view more you can visit my website, see my portfolio at Advocate Art or contact me directly via email. Links are below! Ooh and click the various pages at the top of my blog to view some small samples of my work. All contents of this site are copyright © to Kimberley Scott. Copyright © Kimberley Scott. Simple theme. Powered by Blogger.